4. Questions and Answers: Yedsirag. Toodle-oo Ron Hann asked me if I’d ever encountered another term for goodbye that also ends in oo — the distinctive and delightful Australian hooroo. I hadn’t but I’m glad that I now know it. It’s from hooray, first recorded in the specifically Australian sense of goodbye in 1870. Over time it changed into hooroo, which is the form you will find in the Macquarie Dictionary, but it can lose its initial h to make ooroo. Another of similar shape is napoo, which is used to mean goodbye in a famous First World War music-hall number that several readers mentioned, whose refrain is “Bonsoir, old thing, cheer-i-o, chin, chin, / Nah-poo, toodle-oo, Goodbye-ee.” In reality, napoo meant that something was over, finished or done for; it’s another of those mangled French expressions I mentioned last time, in this case from il n’y en a plus, there’s no more. Dennis Kiernan asked about ta-ta, a British colloquial term for goodbye, best known globally in the abbreviation TTFN (“ta-ta for now”) that was popularised by the 1940s radio programme ITMA. This defeats the etymologists; all we know is that it first appears early in the nineteenth century and is a variant of the much older da-da, which was used mainly to children. Correction The French phrase à tout à l’heure has a grave accent on both a’s. Christmas break As usual, I’m taking a little time off. There will be no issue of World Wide Words on 24 and 31 December. The next will be on 7 January 2012. Seasonal greetings to everyone. See you in the new year. You’ve probably seen one of these being trundled along the road by a surveyor, though it’s unlikely that either he or you will call it a waywiser. It consists of a wheel at the end of a handle, with a counter to measure the number of turns the wheel makes. It’s a quick way of measuring a distance and has been known in various forms since antiquity — the Roman architect and military engineer Vitruvius described one in detail in the first century BCE. It was one part of a way-wiser for the sea; the whole engine being designed to keep a true account, not only of the length of the run of the ship through the water, but the true rumb or leeward way, together with all the jackings and workings of the ship. An account by Robert Hooke, delivered at the meeting of the Royal Society on 28 Nov. 1683, quoted in The History of the Royal Society of London by Thomas Birch, 1757. Rumb would now be spelled rhumb, meaning “a line or course followed by a ship sailing in a fixed direction”. Today the road version is usually given the trivially accurate name of surveyor’s wheel. It has had others — clickwheel, trundle wheel, cyclometer (on a bike) and odometer (sometimes hodometer) — though this last one turns up today more often for the closely related device in your car that indicates how far you’ve driven. 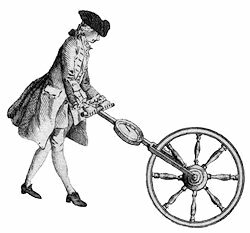 In earlier times there was yet another name for it: perambulator. This has only a limited connection with the carriage for conveying babies. The waywiser sense derives from the old meaning of perambulator for somebody who walks about for leisure. In the seventeenth century a perambulator was a person who carried out a formal circuit on foot to record the boundaries of an area (a perambulation), hence a type of surveyor. The term later shifted from the person to the measuring device or pedometer he used. Words of the year This week, it was the turn of publisher Merriam-Webster to pick one. It chose pragmatic. A curious choice, you might think, since it doesn’t directly apply to any event of 2011. The publisher selected it because it was the word most often looked up in its online dictionary during the year. There were two peaks, one in the weeks before the US Congress voted in August to increase the nation’s debt ceiling, and again as its supercommittee tried to craft deficit-cutting measures this autumn. John Morse, the firm’s president, suggested it sparked dictionary users’ interest because it captures the current American mood of encouraging practicality over frivolity. Most people who recorded a reason for looking it up said that they wanted to confirm that it was meant positively. Q From Roger White: I have just read Lifting the Latch, which is the story of Mont Abbott’s work on the land in Oxfordshire in the first half of the 20th century. The phrase “Brusher were the yedsirag over all the steam ploughs” appears in it. The glossary defines yedsirag as meaning head man, foreman. I can’t find any reference to this word on the web, can you shed any light on its origin? Chisel were the only true ringer among us so we made him yedsirag, Captain of the Tower. 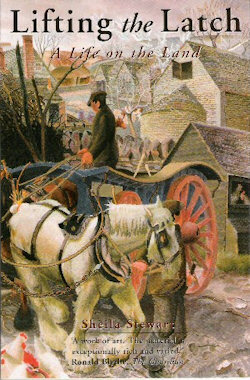 Lifting the Latch: a Life on the Land, Based on the Life of Mont Abbott of Enstone, Oxfordshire, by Sheila Stewart, 1987. He was gooin’ orderin’ an’ mesterin’ abait, just for aw the world as if he’d bin top-sawyer an’ yed-sirag o’ the lot. The Folk-Speech of South Cheshire, by Thomas Darlington, 1887. Mesterin’: acting like a master, an employer. There’s no mystery about yed, which is a common dialect form of head. The rest is a locally modified version of the phrase Sir-Rag. You may be surprised to learn that there’s an entry for this in the Oxford English Dictionary, but it was at one time a fairly common colloquial term. Thomas Ratcliffe of Worksop, writing in Notes and Queries, 15 Aug. 1891. I were on the last lap of the day, longing for me tea and our Mam’s roly-poly, when ‘Brusher’ Becket came into the field waving a telegram. Brusher were the yedsirag over all the steam-ploughs. • “This is from a mystery I resorted to last evening as distraction from work,” e-mailed Gloria Varley. “A young woman has just bought a take-away cup of coffee. ‘Valerie Lathem’s snug green cargo pants paused on the sidewalk to touch her full lips to the edge of the lid. A shiver of delight followed ...’.” Ms Varley didn’t say, but the book is Through the Grinder by Cleo Coyle of 2004. Last modified: 17 December 2011.